SeraCare Life Sciences has expanded its range of mononuclear cells with the launch of off-the-shelf AccuCell human cord blood mononuclear cells (CBMNCs). Viability of these cells after thawing is validated at better than 90%, says SeraCare, making these cryopreserved CBMNCs useful in stem cell research, vaccine manufacture, drug discovery, translation, separation, and expansion services. The CBMNCs are processed at ISO-certified facilities, and the product is available in large lots to support long-term research work and multiple-laboratory projects. “SeraCare has a consistent, ready supply of the human cord blood”, said Tina Patel, associate technical product manager. “Many of our customers need CBMNCs rapidly, and need to compare them to Peripheral Blood Mononuclear Cells (PBMCs) during the course of their work. By providing cell lines off-the-shelf, SeraCare offers time savings and efficiencies”. 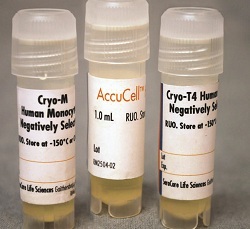 As well as this new cryopreserved range, SeraCare offers custom CBMNC and peripheral blood mononuclear cell (PBMC) isolations for both normal and disease-state material. Various fill sizes and cell counts from donors of diverse demographics are available.